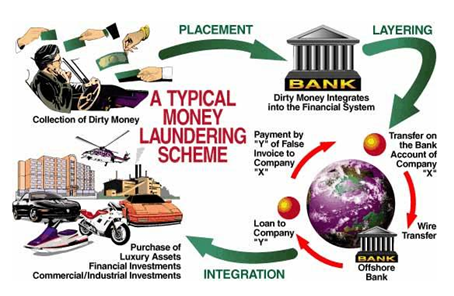 Money laundering is rampant globally. 'The estimated amount of money laundered globally in one year is 2 - 5% of global GDP, or $800 billion - $2 trillion in current US dollars.' (UNDOC). The staff of financial institutions, must be aware of their responsibilities in preventing the 'dirty money' entering into the system. They must also understand the Anti-money laundering regulations to ensure compliance as individuals and institutions. Sadly, some corporates and professionals fail to comply with the regulations due to negligence. Others intentionally violate the regulations. The cost of noncompliance is too high. The bottom line: Directors, Management and Staff of financial institutions, Make sure you full understand your regulations and comply! 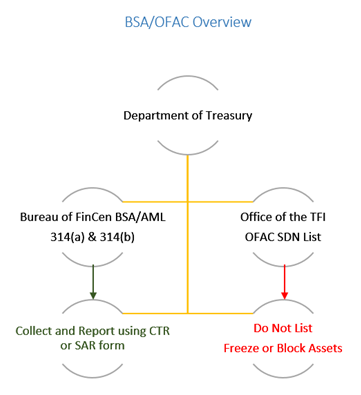 This article provides an overview of the pertaining BSA/AML and OFAC regulations to help financial professionals comply. It also discusses the regulatory bodies, their functions in brief and directs you to useful resources for compliance. "Money-laundering is the process that disguises illegal profits without compromising the Criminals who wish to benefit from the proceeds." Why have the Anti-Money Laundering Regulation? Talking about the purpose of the money laundering regulations on 23rd April, 2013, James H. Freis, Jr., the FinCen Director, identified why the AML regulations are needed. "The Financial Crimes Enforcement Network ("FinCEN") believes that Residential Mortgage Lenders and Originators ("RMLOs" (e.g., independent mortgage loan companies and mortgage brokers) "are primary providers of mortgage finance - in most cases dealing directly with the consumer and are in a unique position to assess and identify money laundering risks and fraud while directly assisting consumers with their financial needs and protecting them from the abuses of financial crime." The key regulatory bodies and their functions are discussed in the last section of this article. AML regulatory requirements - What is expected of financial institutions? 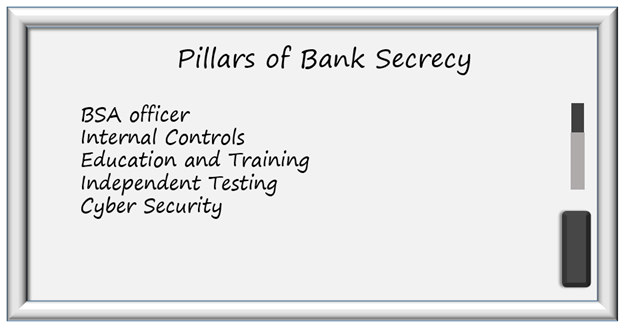 The Bank Secrecy Act (BSA) is the primary U.S. anti-money laundering (AML) law. The Act is designed to aid federal government in detecting illegal activity through tracking certain cash-based transactions. Lenders are required to file reports of daily transactions conducted in currency in amounts over $10,000. Well-designed training programs are an integral part of the BSA/AML and OFAC compliance program. While the staff training should be ongoing, it is also important to ensure that it is documented and incorporates the current developments and changes to the BSA/AML regulations. Everyone attending the training must understand their part in maintaining compliance. Testing should include all of the entity's activities and the results to help the Board of Directors and or/Executive management identify gaps, make improvements and establish additional controls. Also, the Company's written policies and procedures, the qualifications of the AML officer, the training materials and attendance logs must be reviewed. The Final Rule for Customer Due Diligence (CDD), effective July 11, 2016 for banks and other covered financial institutions to identify and verify the identity of the natural persons behind the legal entity customers - the beneficial owners. Administers and enforces economic sanctions Targeted foreign countries, terrorists and terrorism sponsored organizations, International narcotic traffickers. Gathers and provides information to financial institutions, law enforcement and Insurance companies and others. Regulates and supervises all national banks and thrift institutions and the federally licensed branches and agencies of foreign banks in the United States to determine whether or not the bank is operating safely and soundly, providing fair access and treatment to customers, and complying with all applicable laws and regulations. The Board of Governors, the Federal Reserve Banks, and the Federal Open Market Committee work together to promote the health of the U.S. economy and the stability of the U.S. financial system. Promotes consumer protection and community development. Primary federal regulator of all federal and state-chartered savings institutions across the nation that belong to the Savings Association Insurance Fund (SAIF). OTS issues federal charters for savings and loan associations and savings banks. This Bureau also adopts and enforces regulations to ensure that both federal and state-chartered thrift institutions operate in a safe and sound manner. Provides deposit insurance to depositors in U.S. commercial banks and savings institutions. Examines and supervises certain financial institutions for safety and soundness, performs certain consumer-protection functions, and manages receiverships of failed banks. Enforces the Securities Act of 1933, the Trust Indenture Act of 1939, the Investment Company Act of 1940, the Investment Advisers Act of 1940, the Sarbanes-Oxley Act of 2002, and other statutes. Responsible for collecting taxes and administering the Internal Revenue Code, the main body of federal statutory tax law of the United States. Oversees various benefits programs, and enforces portions of the Affordable Care Act. AML/BSA Boot Camp - This course is approved by NASBA (National Association of State Boards of Accountancy). Seminar attendees are eligible for 16.5 CPE credits upon completion of this workshop. BSA/AML Contextual Awareness of High Risk Customers - This webinar will highlight the steps to identify and evaluate high-risk customers. Learn how to perform BSA, AML risk assessments. Bank Secrecy Act (BSA) Audit Best Practices - This BSA audit training will explain how the best practices in a BSA audit have evolved over the years. It will cover the major components of an effective BSA program that the audit focuses on and the specifics of each area as it pertains to BSA audits. AML Model Validation: A Critical Need in the New Regulatory Environment - This training program will discuss the history and origin of a model validation. It will also discuss the requirements by the OCC for a model validation, and what exactly a model validation should include. The session will also analyze the elements of a model validation to know what to look for in an RFP, and detail the requirements included in Final Rule 504. FinCEN's New CDD Rule - The New Fifth Prong of the AML - This course is focused beyond the initial customer acceptance step, requiring updating and ongoing monitoring against baseline "normal" activity for the customer type. This course is approved by NASBA (National Association of State Boards of Accountancy). Attendees of Live Webinar are eligible for 1.2 CPE credit up on full completion of the course. Banking MSBs: BSA/AML Risks, Mitigation of Risks and Rewards - This course is designed to assist Financial Institutions in formulating their strategy for banking MSBs, regulatory bodies overseeing MSB compliance, income and expense characteristics in banking MSBs, balance sheet impacts, perceptions and misperceptions of MSBs, risk between MSB entities and how to strengthen your financial institution's BSA/AML program. Tax Evasion and Tax Fraud - What it means to you when monitoring BSA and filing SARs -This training on BSA compliance will help you understand the concept of tax evasion and tax fraud and the difference between the two. Learn the best practices to identify tax fraud and how to report suspicious activity. FinCEN Final Rule on Customer Due Diligence Requirements | BSA/AML Policy, CIP Procedure - The instructor will help Interpreting key definitions and type of information your institution will need to obtain from customers. He will also discuss how to identify potential changes/updates you may need to make to your BSA Policy, including CIP procedures, and account opening processes. Preparing for a BSA/OFAC Regulatory Examination - This webinar will address steps a company can take in advance to optimize the progress of a BSA/OFAC regulatory examination. It will provide guidelines for positively and accurately representing your AML and OFAC programs to regulators for the most efficacious outcome. BSA/AML Compliance Checklists - This training on the Bank Secrecy Act will highlight the development and implementation of BSA/AML Compliance Checklists. Attendees will learn the best practices to avoid BSA violations.